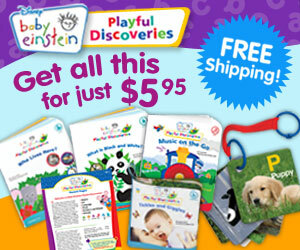 Baby Einstein Playful Discoveries Set, Just $5.95 Shipped at Early Moments! Long before we know it, our babies are off for their first day of school. Give them a jump start with Disney’s Baby Einstein Playful Discoveries Program from Early Moments. This book club for kids delivers fun, age-appropriate learning packages each month. Playful Discoveries packages help babies engage with the world around them and develop a life-long love of learning, music, art and more. For a short time, new subscribers get the welcome package for just $5.95 shipped! This set includes: 3 board books, a plush book, a pack of discovery cards, and a guide for parents about how to help baby learn and grow. Even better, there’s an optional jumbo board book available for 50% off. Securely enter contact, shipping and billing information.